The following message was sent from the UW-Green Bay Chancellor’s office to faculty and staff at the request of UW System President Ray Cross on Thursday, November 9, 2017. Today, the Board of Regents approved moving forward with a restructuring proposal for the UW System. The purpose of the restructuring is to expand access to higher education by leveraging the strength of our comprehensive and research institutions at our two-year campuses, and all two-year campuses will remain open. Student recruitment should still move forward as usual. We will continue to offer associate degrees at our two-year campuses, and the intent is to actually bring more classes onsite in the future. Students will continue to be able to transfer to any UW institution of their choosing – just as they do now. We will maintain existing tuition levels for classes currently offered at the two-year institutions to keep them affordable for students and families. Demographics are changing rapidly in Wisconsin. We want to respond proactively to the urgency of the situation so that we can set a positive course for UW System’s future. In the spirit of the Wisconsin Idea, our goal is to continue to provide world-class public higher education, research, and outreach services into the 21st century and beyond. To do so, we must manage the demographic, enrollment, and financial challenges the two-year campuses face, while maintaining a sustainable, viable presence in these communities. Now that the Regents have approved the concept, we will move forward into the implementation phase. We are committed to engaging students, faculty, staff, community leaders, and other stakeholders in making this a successful transition. Regional restructuring committees are being established, which will inform a central Steering Committee. All of our stakeholders will have a voice in this process, so please watch for upcoming events at your campus. We encourage you to visit our restructuring website at www.wisconsin.edu/uw-restructure to learn more about the proposal. We continually update the content, and you can read FAQs and sign up to be notified when we add new content to the site. Thank you for your continued support and commitment to our students and the citizens of Wisconsin. 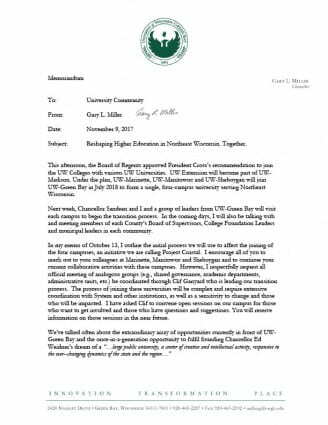 The UW-Green Bay Office of the Chancellor e-mailed the following memorandum from Chancellor Miller to UW-Green Bay campus community on Thursday, November 9, 2017. Memorandum: Reshaping Higher Education in Northeast Wisconsin. Together. Subject: Reshaping Higher Education in Northeast Wisconsin. Together.